For the third year in a row, we are releasing the Daily Dare NC Challenge. 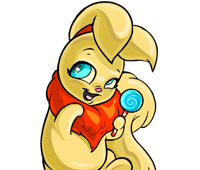 It will begin at 12:00:00 AM Neopian Standard Time on March 1st, 2011, and end at 11:59:59 PM NST, March 31st, 2011. The Daily Dare NC Challenge allows you to challenge Lulu, a Cybunny gamer, at 31 different games. The games are the same as those in the regular Daily Dare challenge, but the prizes you'll earn if you beat or match Lulu's scores are exclusive NC prize items. If you successfully complete all 31 games, you will also earn an exclusive bonus NC item. The NC Challenge can be played along with the regular Daily Dare and does not replace it. To participate in the NC Challenge, you must purchase a Game Ticket (or tickets) from the NC Mall Daily Dare Shop or receive one as a gift from another player. You must then activate the Game Ticket in your Inventory. Once you have activated a Game Ticket, you may select a game in which to challenge Lulu from the game menu on the NC Challenge main page. Clicking on a game will prompt you to confirm that you would like to use your Game Ticket to "Challenge Lulu". Each game challenge requires one Game Ticket. Once you have challenged Lulu to a particular game from the game menu, you may play that game as many times as you'd like every day until the end of the Daily Dare NC Challenge. You may send scores as many times as you would like for a selected game; however, you will only earn Neopoints on the first three scores you send for a particular game each day (whether it's played in Daily Dare or the NC Challenge). You can practise a game as much as you would like by selecting it from the game menu on the Daily Dare NC Challenge main page and then clicking on the game image in the centre marquee -- just don't send your score after completing the game, unless you want it to count as one of your three scores for that day. Note: once you have clicked "Yes" in the game confirmation window, you will not be able to change your game selection for that ticket. If you can play and complete all 31 Daily Dare NC Challenges by the end of Daily Dare, you will also earn an exclusive bonus prize! This bonus will be awarded on April 4th, 2011. Game Tickets are sold individually and in packs of 5, 10, and 31. You can purchase as many Game Tickets as you'd like, but a maximum of 31 can be used for game challenges. Non-activated Game Tickets may be placed in your Gallery or Safety Deposit Box or gifted to other users (using NC Gift Boxes). Game Tickets will no longer be valid for game play after the Daily Dare NC Challenge has ended; Game Tickets purchased for this year's NC Challenge cannot be used for any future NC Challenges. Game Tickets, as with all Neocash items, cannot be sold or traded. For more information, please visit the Daily Dare NC Challenge FAQ.